The World Food Summit (WFS), which gathered in Rome two years ago, will hardly enter history as a landmark conference like the 1974 World Food Conference or the 1992 Rio Earth Summit. But it did open a few windows of opportunity, which could have a fundamental impact on the way we deal with food and development problems in the future. The most promising is the human right to adequate food. The Summit reaffirmed the right of everyone to have access to safe and nutritious food, consistent with the right to adequate food and the fundamental right of everyone to be free from hunger (FAO 1996, Rome Declaration). This somewhat lengthy, cumbersome formulation reflects a measure of disagreement among Summit participants, notably on the part of the United States. The United States put on record that it “does not recognize any change in the current state of conventional or customary international law regarding the rights related to food. The United States believes that the attainment of any “right to food” or “fundamental right to be free from hunger” is a goal or aspiration to be realized progressively that does not give rise to any international obligations or diminish the responsibilities of national governments toward their citizens” (FAO, 1996, Part I, Annex II). But precisely the lack of unanimity, together with the frustration on the part of many countries at decades of right-to-food rhetoric with too little concrete action, led to what could be considered a landmark decision: the international community at large– governments, civil society, international institutions– should clarify the right to adequate food and the fundamental right of everyone to be free from hunger and propose ways to implement and realize it (FAO, 1996, Plan of Action, paragraph 61). For the first time since the Universal Declaration on Human Rights was adopted by the United Nations in 1948 and whose 50th anniversary is being celebrated this year, a global summit challenged the international community to give operational meaning to the human right to adequate food and to be free from hunger– one of the rights most frequently cited in solemn declarations of political intent and most neglected and violated in practice. 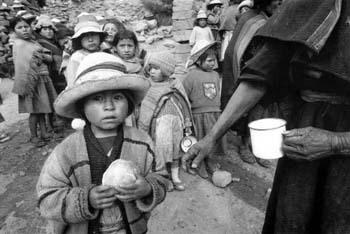 The right to adequate food is widely recognized in international law. The most basic provision is found in the Universal Declaration on Human Rights (UDHR), which stipulates that everyone has the right to a standard of living adequate for the health and well-being of himself and his family, including food…. This provision is further elaborated in the 1966 International Covenant on Economic, Social and Cultural Rights (ICESCR), to which some 180 States (but not the United States) are Parties. In recognizing the fundamental right of everyone to be free from hunger, the ICESCR identifies a set of core actions related to food production and distribution as well as nutrition. The 1989 Convention on the Rights of the Child (CRC), ratified by 191 States (not the United States), recognizes food- and nutrition-related rights in the context of the right of the child to the enjoyment of the highest attainable standard of health. At the regional level, the right to adequate food is most clearly spelled out in the (not yet ratified) Additional Protocol to the American Convention of Human Rights in the Area of Economic, Social and Cultural Rights. And there is a host of other instruments, declarations or pronouncements, in which the right to food is reaffirmed or referred to. Lack of application of the right cannot just be attributed to the habitual lack of political will of governments. Human rights nongovernmental organizations (NGOs) and scholars have equally tended to neglect it in their work. And development practitioners largely fail to see the value added by using a right-to-food approach as compared to various forms of conventional basic-needs strategies, through which they have sought to deal with hunger and poverty. Failure to bridge the largely intellectual realm of the human rights debate and development practice, and to bring about a joint vision of development among people with a background in law and those trained in various development disciplines has impeded effective advocacy in support of the right to food with governments, international development agencies, the private sector and civil society at large. What Difference Does a Rights-based Approach Make? What are the differences between a rights-based approach and conventional basic, needs-based strategies? What benefits can be gained by introducing the right-to-food dimension? This Bolivian child holds a piece of bread, a rare treat in a village where underemployment is chronic. With a human rights approach to adequate nutrition, the government of Bolivia, and the international community, would have to consider how the poorest people could be integrated into the international economy of production and income. To this end we will create a framework for action to:…promote universal respect for, and observance and protection of, all human rights and freedoms for all, including the right to development; promote the effective exercise of rights and the discharge of responsibility at all levels of society… (United Nations, 1995, paragraphs 25, 26; emphasis added). A human rights approach thus removes the charity dimension inherent in basic needs strategies, however valuable this may be, and emphasizes rights and responsibilities. It recognizes beneficiaries as active subjects and claim-holders and establishes duties or obligations for those against whom a claim can be held (objects or duty-bearers ) to ensure that needs are met. That moves the focus to where it should be: development by people themselves, not for them. The concept of claim-holders and duty-bearers introduces an important element of accountability. Increased accountability holds the key for improved effectiveness of action and as such offers the potential for added value flowing from the application of a rights-based approach. Implicit in the introduction of a rights dimension are also attitudinal aspects whose potential political impact should not be underestimated. A basic needs view of the problem of chronic hunger in the developing world may state that 80 percent of the population is able to meet their food needs, while a rights position would have to emphasize that the right to food continues to be neglected or violated in the case of 20 percent of the developing countries’ population. Introduction of a rights approach would also have important implications for the analysis of food and nutrition problems and for policy and program planning. Conventional analysis of causal factors of identified problems would need to be complemented by a multifaceted role/responsibility analysis of obstacles confronting the realization of the right to adequate food, from the household up to the national and international levels. This would be the basis for determining who is to be held accountable for the existence of such obstacles and who would be responsible for their removal (Jonsson, 1997). Human rights are legally binding for states, not optional as in the case of recommendations from global summits and conferences. National law and policies need to be brought into agreement with what the state has agreed to internationally. This will recognize the state’s limitations in providing such essential aspects of economic human rights as employment, but also recognize the need, where appropriate, to increase the state’s effective concern in these areas. By using a human rights entry point, the entire human rights framework is brought into play: civil and political rights as well as economic, social and cultural rights. Human rights require active and effective remedies, not necessarily by the use of courts, but any person or group whose rights are violated should have access to appropriate remedial measures, juridical or otherwise. Rights imply accountability, both domestic and international, and thus contribute to good governance. Under international covenants, states are obliged to submit periodic reports on the human rights measures they have taken. These reports are public and accessible, now accessible even on the Internet, and can be used to hold governments accountable for non-compliance with their obligations. On reflection, using the concept of value added by a human rights approach is misleading for two reasons: 1) it suggests that there is a choice between an ethics-based rights approach and other approaches, and, 2) when applied, a rights approach constitutes some kind of add-on, something that may be desirable but not necessary. Such suggestions are no longer tenable in a world undergoing the revolutionary changes of the liberalization and globalization of economic and financial markets, which are of no lesser significance than the 19th century industrial revolution. The dominance of the liberalizing and globalizing marketplace is affecting all spheres of life in every corner of the world. Directly and indirectly, it is affecting the sovereignty of states by transcending conventional political boundaries– changing and even reducing the roles of governments. Even more importantly, it is affecting human beings and the relations among us. The global market place treats human beings as objects and, most often, as obstacles and will result, if unchecked, in more poverty, more hunger, more civil strife and armed conflicts and the denial of the right to food for millions (Spitz, 1996, emphasis added). These risks are real. They can and must be checked, if globalization is to bear fruit for people and not just the actors of the market place. The 1995 Social Summit showed the way for doing so, through its emphasis on ethics and human rights in development. By adopting international human rights agreements governments have committed themselves to an ethics and human rights dimension in development. That ethics and economics need to come together rather than being considered irreconcilable antagonists has been a frequent theme of Pope John Paul II. In underlining the advantages of a globalized economy in a recent address, Pope John Paul II pointed at the same time to the need for harmonizing the exigencies of the market with those of ethics and social justice (John Paul II, 1998). Globalization of the market place must be matched by globalization of solidarity based on human values and norms anchored in ethics and human rights. This is the challenge at the threshold of the third millennium. Neither globalization of human solidarity, nor a principal component of this effort, implementation of human rights, including the right to food, will be achieved overnight. It will not mean replacing current development efforts, but progressively redirecting them. The human rights approach is already changing policy. The UN Secretary General’s proposal that all UN funds, programs and specialized agencies should be guided by the international human rights framework, and a recent directive by the Executive Director of UNICEF that all its field activities be guided by the Convention of the Right of the Child (WANAHR, 1998) are proof that the idea of an ethics-based human rights approach to development is no longer just in the intellectual realm of human rights lawyers, but is moving into the field of development practice. It remains as well for the rest of us, as citizens and as those involved with development, to consider how our nations and our programs can operationalize the right to food and other human rights. The author is co-coordinator of the World Alliance for Nutrition and Human Rights (WANAHR), a network of scholars and institutions striving to advance the application of food and nutrition rights in the fight against hunger and malnutrition. WANAHR’s secretariat is based in Oslo, with an office in Rome. FAO: Report of the World Food Summit, Nov. 13-17, 1996, Rome. John Paul II. Address to the “Centesimus Annus-Pro Pontifice” Foundation, May 9, 1998, Vatican Information Service VIS 980511 (250), Vatican City. Jonsson, Urban. Realization of Children’s Rights: Charity or Solidarity? Internal UNICEF Draft No.3, Dec. 3, 1997. Kracht, Uwe. The Right to Adequate Food: Its Contents and Realization. An issues paper prepared for consideration by the UN Committee on Economic, Social and Cultural Rights at its Day of General Discussion on Dec. 1, 1997. Spitz, Pierre. The Right to Food and the Role of Finance, Food Policy, 21:1, pp.17-21, 1996. United Nations. Report of the World Summit for Social Development, Copenhagen, March 6-12, 1995, A/CONF. 166/9, New York. WANAHR (World Alliance for Nutrition and Human Rights). The Promotion and Protection of the Human Right to Food and Nutrition by ACC-SCN Member Agencies– Obligations and Opportunities. A Resource Paper prepared by Wenche Barth Eide and collaborators for the 25th Session of the ACC-Sub-Committee on Nutrition, March 27-April 4, 1998, Oslo.